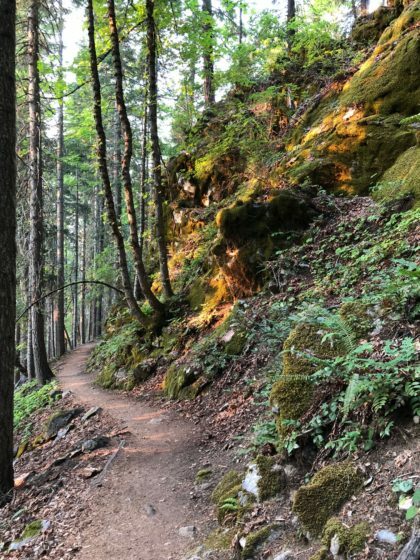 On a recent visit to Oregon Caves National Monument and Preserve, we found that there was much more to the park than just the cave. 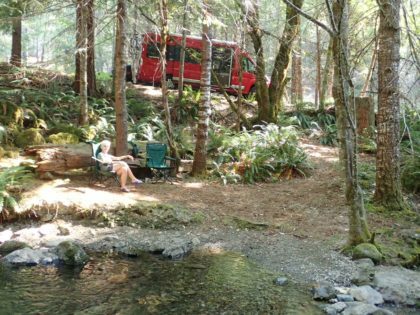 Your first adventure is to drive up the steep, winding mountain road from Cave Junction, in the southwestern corner of Oregon, to find a mountain oasis. Incredible Douglas Firs towering above you in the old-growth forest; a wonderful old chateau; great hiking and camping; and oh yeah, a fun cave tour! 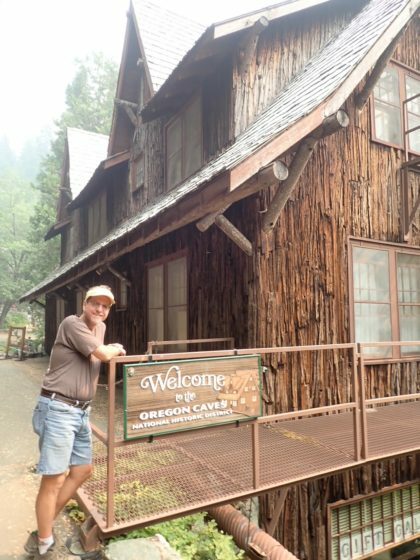 People have come to Oregon Caves for over 100 years. The caves were actually discovered back in 1874 and for many years, for just a couple dollars a local would take you on a tour. Unfortunately they left behind a bit of graffiti and took home some souvenirs. The National Park Service took over the caves upon order of President William Taft to protect and preserve them. The National Park system actually includes a bunch of caves and lava tubes all around the country. 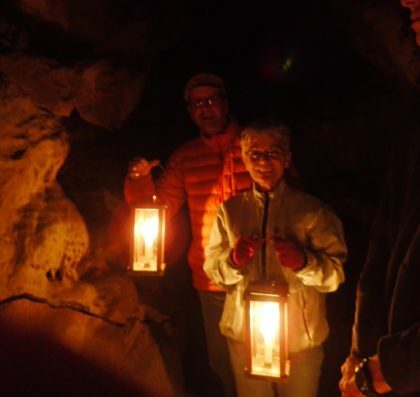 Along with Oregon Caves, we have visited Mammoth Cave, Wind Cave, Russell Cave, Jewel Cave, Timpanogos Cave, Coronado Cave, El Malpais, Lehman Cave and Lava Beds. Every one is unique in its own way! For our visit to Oregon Caves, we decided to do it different. Here they offer a candlelight tour. No lights, just good old-fashioned wax candles. Each person carried their own and that was the only light. The ranger-led program takes you back in time to when the cave was first discovered. They will tell you a tall tale of the first person to find the cave, rushing in after his dog and a bear with only 5 matches! At the deepest point of the cave, everyone blows out their candle. Man was that dark! No way would we be going down there with just a few matches and only the sound of running water (the River Styx) to help guide us out! Fun Fact: The River Styx is the first and only underground river named to be a National Wild and Scenic River. The walk through the cave is about a half mile, so you should have lots of energy to explore some of the great hiking trails. In only two days, we couldn’t do them all. We did the Nature Trail – there are great views, especially at sunset. We also made sure that we went up to see the Big Tree. It’s a pretty strenuous hike – you’ll go up almost 1000 feet in a mile – but the tree is incredible. 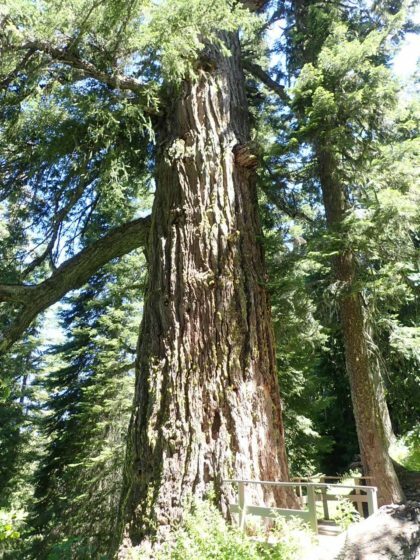 It is widest girth Douglas Fir in Oregon; over 41 feet in circumference. The forest is full of huge Douglas Fir trees, plus the very unique Pacific Madrone and tons of ferns! Almost tropical. We were very surprised. A hidden gem is the National Park Service campground – Cave Creek Campground – just 4 miles from the visitor center and offering 17 campsites. It’s not fancy. There are water spigots and pit toilets, but it is only $10 per night and right on Cave Creek. Ranger Kelly directed us to site #8. It is one of the nicest campsites we have every had. The soothing sound of the water put us to sleep each night. There is a lovely hike from there up to the caves. It is less than 2 miles, uphill, but not terribly steep and mostly along Cave Creek. The trail is very well maintained and scenic. At the top, you can hook up with the No Name trail and take in the views on your way to the visitor center. As you rest up after a hike, or before taking a cave tour, be sure to visit the historic Chateau. Built in the 1930’s this 27 room hotel has a ton of history. Fun Fact; One the founders was the inventor of the “Viewmaster” - do you remember those? You can buy one in the gift shop! There is a daily ranger-guided tour; interesting if you want to see a room and hear more about the building. Ranger Ethan pointed out the furniture; some of the original chairs are still in the great room beside the huge marble fireplace (the same marble you will see in the cave). Also interesting is the architecture. It is all built using stone and wood from the area, with the intent that it would fit right into the mountain. We were astounded to hear that the building was 7 stories tall! You would never know that looking at it. They have a lovely dining room and a fun cafe. It looks like an old-fashioned diner, complete with root beer floats and home-made milk shakes. You can eat or drink inside, or sit on a swinging bench by the pond and waterfall outside. Very relaxing. The summer of 2018 will be your last chance to visit the Chateau for a couple years. They will be closing it for restoration; upgrading it without losing the historical charm. 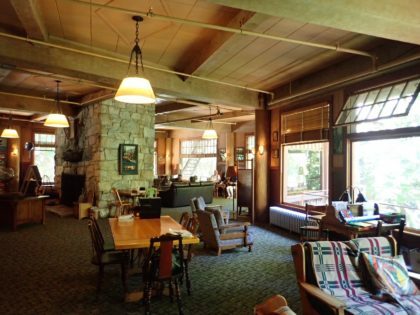 The Chateau at Oregon Caves is one of three great lodges in Oregon; Timberline Lodge and Crater Lake Lodge are the other two. 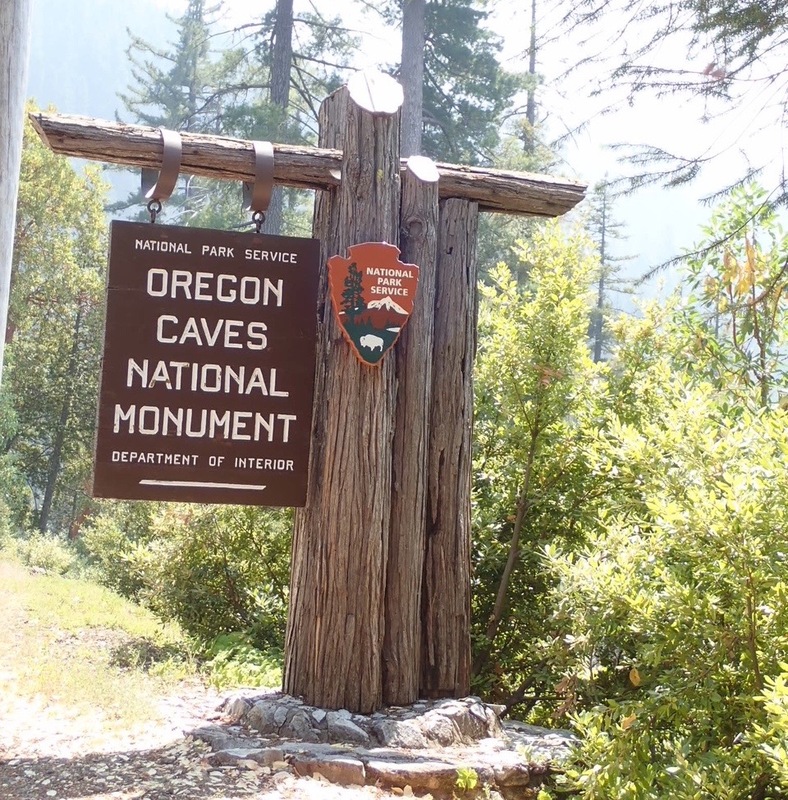 Oregon Caves National Monument and Preserve is far more than just a cave. It has all of the things that we love about national park units. We’ll surely have to come back to take it all in, maybe next time staying in one of those remodeled rooms at the Chateau!